I had our helper prepare the chicken this way, just because I really think it is a nice way to present the chicken. Of course, it would cook easier, and tastier too, if cut up into serving pieces. But hey, it doesn’t look that pretty. 1 chicken, butterflied, about 1.2 kilos. Mix all the of the ingredients for marinating and submerged and massaged chicken in the mix. Allow to marinade for at least an hour. Remove from the marinade before cooking. On the skin (facing up) season lilberally with garlic powder, black pepper and salt. 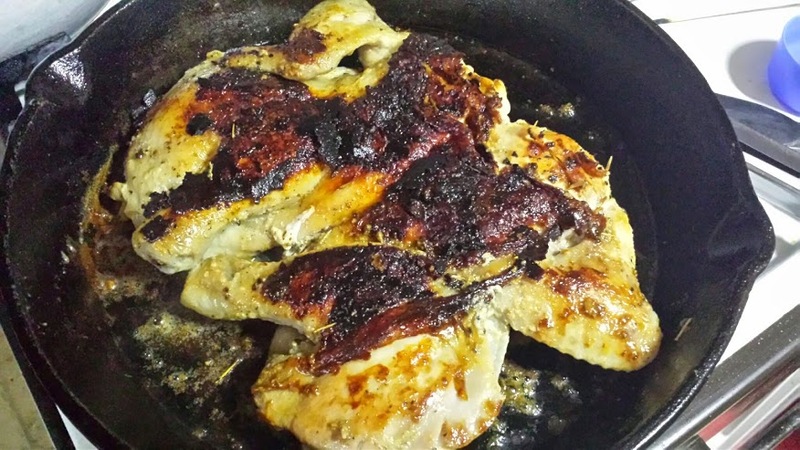 In a hot grill pan, put the chicken skin side down and let it get crusty. While this side is grilling, season the underside some more with the same ingredients. Cover. After 20 minutes, flip and cook on the other side for 15 more minutes. Add in the broth and let this dry up again, though covered. Serve with rice, or pasta. Yum.